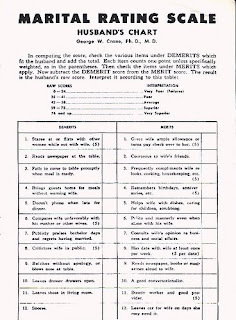 There is a modern version of this test here or you can see the original pages for both husband and wife below. I think the original pages just look 1930ish and the jargon is British, I think. 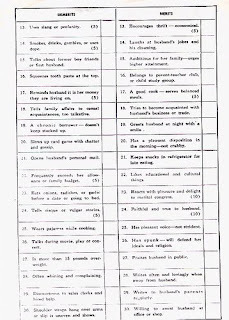 First, the husband's quiz. I love the comments - you don't get that at the test web site - just the questions. When you click on the images below, they will still be too small to read - so you have two options. The first is (if you have a scroll button on your mouse) to click and hold down the Ctrl key while rolling the scroll button - scroll in a downward motion makes the image larger. The other option is to download this completely free "Virtual Magnifying Glass" that I use ALL the time to see things more clearly on my computer screen. For those who don't have a high definition monitor, the magnifying glass may not work too well, but it's worth a try, since it's free!! 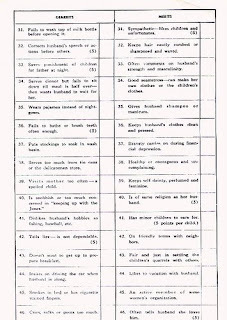 For this to be done correctly, the husband is to rate the wife and vice versa. I know I will get a very poor rating - I cook when I feel like it (which isn't often) and I certainly don't dress for breakfast. My daily outfit is an attractive pair (I like some of the colors and designs) of men's boxer shorts and a matching color T-shirt. 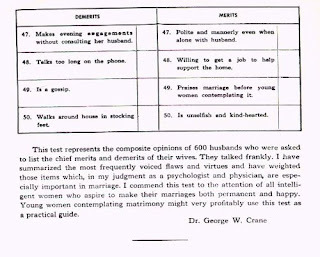 Folks, it doesn't get more comfy than that, however, that type of dress is off the charts for this test. And red nail polish? Perish the thought. Nice girls don't wear red nail polish, I guess - but the secret is, - and this test won't tell you this - men often prefer naughty girls anyway - so be brazen! 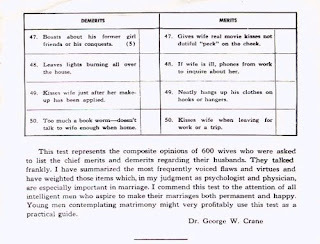 I can tell you my husband got a 98. 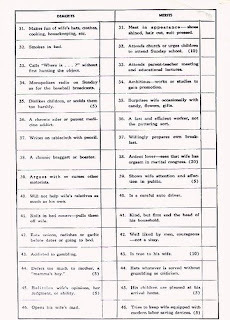 Some of my favorites are "Calls 'Where is', without first hunting the object".....if I had a dime for all the times my husband does this....er....I just got points off for speaking poorly of him in public. Oh well. And the burping thing? Is that funny or what? 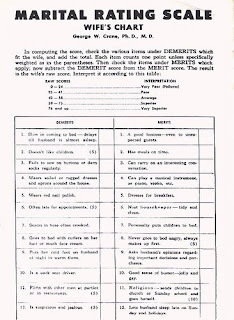 I didn't take the test very seriously, but it did make me think about how it fit my husband and myself. 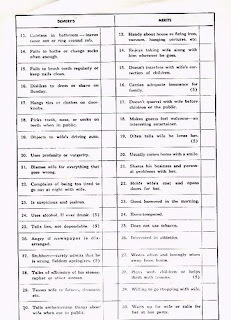 I love the ideas from long ago - so much more civilized than today!